It is over three decades since man started battling the human immunodeficiency virus and the diseases associated with it. Although HIV has caused millions of deaths especially in Sub-Saharan Africa, no fully reliable cure or prevention of the viral transmission has been identified. Drugs that suppress viral replication (antiretrovirals) remain the only hope for millions of persons infected with the virus. Since the approval of the first antiretroviral agent in 1985, over 30 such products have been registered. Treatment regimens changed from single drug therapies to combinations with highly active antiretroviral drugs, and those combinations also keep changing with new information and therapies. Consolidated updates on data and evidence of effectiveness of these drugs need to be availed to scientists and clinical practitioners. The ever increasing information motivated the writing of a comprehensive book containing consolidated information on the different available and upcoming antiretroviral agents. This book, edited by Prof. Gene Morse and Dr. Sarah Nanzigu provides these materials with considerations of approaches by experts from developed and developing settings. We highly appreciate these experts for their valued input. This book with updated information on therapies used in HIV management is carefully relayed under respective classes of drugs including Reverse Transcriptase Inhibitors (RTIs), Protease Inhibitors (PI), Integrase Strand Inhibitors (INSTI), and Entry Inhibitors. Clinically relevant information regarding activity of these agents in different populations is also presented, including comparison of treatment options between resource-limited and resource-rich settings, together with its implications. The book is carefully constructed to become a very valuable asset for scientists and clinicians at different levels of understanding of these drugs. We will highly appreciate feedback from our esteemed readers. The editors and authors would like to appreciate the following people for their various contributions during the writing of this book. They may not have contributed to the actual writing of book chapters, but their availability to; coordinate, guide or counsel was of great benefit to the making of this project. We appreciate Dr. Michael Makanga, Director South-South, European & Developing Countries Clinical Trials Partnership (EDCTP), for the guidance and encouragement offered at several stages of this writing. We appreciate that you kept open doors for consultations. The editors and authors would like to acknowledge the coordinating activities rendered by Mrs. Farzia S. Kaufman, Senior Health Information Research Support Specialist Translational Pharmacology Research Core, NYS Center of Excellence in Bioinformatics and Life Sciences, University at Buffalo. Without you, this piece of work could not have been a success. Appreciation further goes to Mr. Davis Odero Osiemo of Odero Osiemo and Company Advocates, Nairobi, Kenya. The guidance and counsel obtained from your expertise was of great help. 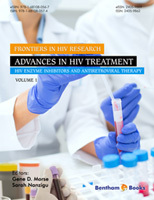 This book focuses on updates in HIV Treatments, an area with a very high turnover of information. Although there aren’t as many new findings related to the human immunodeficiency virus itself, the number of new drugs and targets has grown tremendously since the onset of the epidemic. Treatment guidelines are revised much more often than those of other diseases in order to capture new therapies, changes in regimens, including their indications. Since the onset of HIV epidemic, more than 30 antiretroviral agents have been approved for use in persons infected with the virus, and those at high risk. Although these drugs are grouped in less than 6 classes, each of them possesses some unique characteristics. These unique attributes can influence vital areas including response to treatment and toxicity profiles. This book is intended to provide compiled and updated information on each of the available and upcoming antiretroviral agents, to assist persons involved in HIV clinical care and research. The authors have been selected based on their expertise in HIV/AIDS, and we greatly appreciate your valued input into this work. We trust that our esteemed readers will find this information to be of great value.